What Is The Best Electric Fence For Horses On The Market In 2019? What Is The Best Electric Fence For Horses On The Market? With regards to good horse care, one of the most important things is to make a really good fence to keep them contained. Horses are naturally roaming animals, but we can’t really allow them to do this in this day and age – just imagine the carnage if your horse decided to take himself off for a gallop around the countryside! Making sure you have a really good fence is paramount. 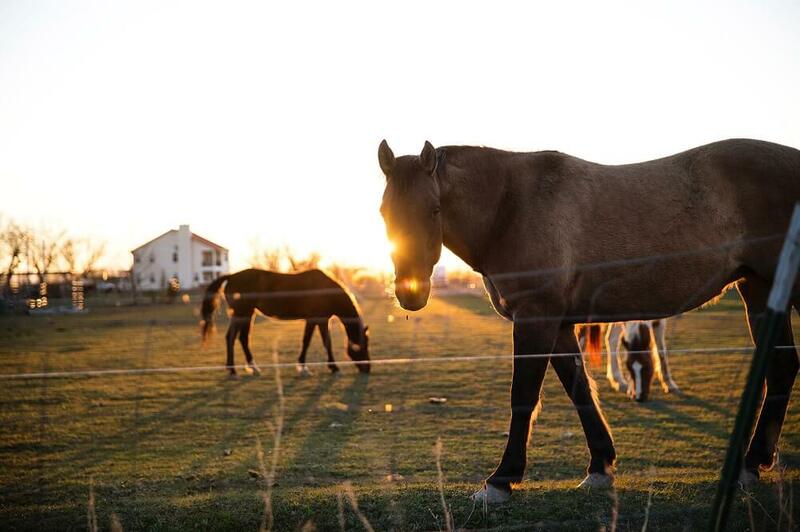 The best type of fencing is wood, followed by electric tape (barbed wire, or any type of metal wire, should never be used for horse fence because of the risk of injury). This is a fantastic braided electric fence. It provides great resistant strength as well as a psychological barrier to prevent your horse running through it. It is a chequered colour, making it more visible and even more of a deterrent. It uses copper wires for an increase in conductivity, meaning that it has more “bite” than a standard fencing wire. Simple to install – It really is easy to set up a perimeter of electric tape – all you need is some posts, a battery and a fencer and you’re away! Strong and resilient – This fence can withstand the force of a stampeding stallion, with a 1300lb breaking strength. High quality tested – ElectroBraid meets the high standards required by parachute harnesses and seatbelts. No danger of injury – Unlike a wooden fence that can splinter, or a wire fence that can entangle flailing hooves, ElectroBraid is pretty much guaranteed to keep your horse contained without the risk of injury if he runs into it. Potentially can break – If this happens you will have to redo all your fencing, because once the horses know they can push through the fence without getting zapped, they will continue to do so. 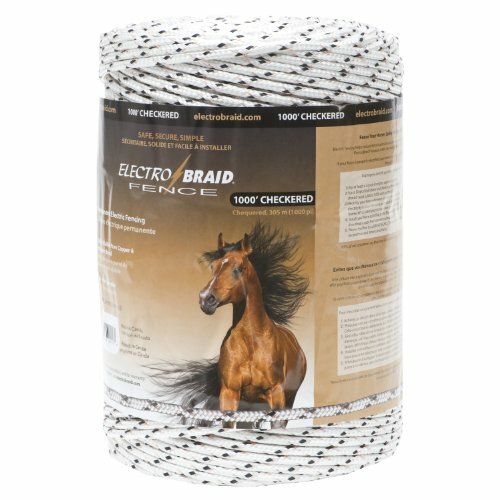 For a good, sturdy, reliable fencing tape, the ElectroBraid is a good one to go for. It is a highly effective fencing solution that will last for years, and will keep your horses contained and safe. Made from polyester fibre, which is resistant to corroding and damage from UV light, the ElectroBraid can be your best friend for years to come. Polyrope is stronger than polywire, and is less likely to cause damage if your horse runs into it. It is fantastically easy to install, and will last for many years to come. As long as you make sure you have a good battery connection with no trailing grasses touching the wires and causing a short to earth, then this polyrope will work wonders. An inexpensive product – If you are looking for good quality electric fence on a budget, then this is the one for you. It is cheaper than many of the competitors, but will still do the job. Lightweight and easy to use – If you find yourself moving your fences often, then this is a great option. It is easy to wind back onto the reel, making twisted tangled fencing tape a thing of the past! Breaking load of 880lb – This fence can stop a medium-weight horse in its tracks, and send it bouncing back into the field with no danger of injury. Highly visible – As long as your horses already have respect for electric tape, then just the sight of it will be a good deterrent. May not be as durable as some of its counterparts – The manufacturer’s recommendation is to use this fence in conjunction with a permanent fence, meaning that it may not be suitable for you if it is to be your only form of fencing. If you need some good quality, reasonably priced electric tape to go with your existing fence then this is a good one to go for. Strong, durable and visible, it will provide a physical and psychological barrier to potential escapees. A good choice for creating paddocks and enclosures, the Farmily portable polywire is a robust, highly visible tape. It comes in vivid yellow and black, making it even more of a deterrent – and if the colour doesn’t stop them, the zap from the stainless steel electric conductors will! Designed for long life – The polyester surrounding the conductors is UV stabilised, meaning that the sun won’t damage it over time. Protected and rustproof – The stainless steel conductors are carefully wrapped in the outer polyester, meaning that they are at no risk of damage from the rain. Easy and convenient to store and install – The polywire is easily wound back up onto its spool, making life much easier when moving paddocks around. Waterproof for year-round use – Even when the rain is damping down everything else, your fence will still pack a punch. Thinner than some other wires – This can mean that the wire may break more easily than others, resulting in having to splice it or replace it. A good option for temporary fencing, the Farmily Portable is a good option for those who need to put up some emergency fencing quickly, that works well for keeping in what needs to be kept in, and keeping out what you want to keep out! Electric fencing is an inexpensive, effective way of keeping your horses contained. This type of wire fencing is good because it means members of the herd who don’t want to live in close proximity can still see each other – horses are herd animals and feel safer in large groups. It’s a lot cheaper than paying to have wooden stock fencing installed, and a lot safer than other types of wire fencing. You will just need a fence charger that can be attached to a battery or you can use a solar power charger. 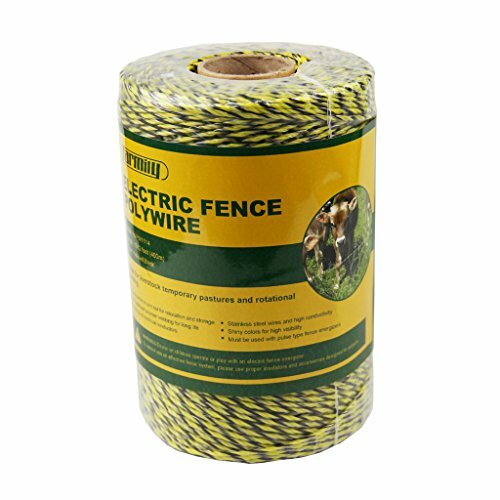 If you need a really top end electric fence, for horses which don’t have a lot of respect for other fencing tapes, then the ElectroBraid PBR1000 C2-EB Horse Fence Conductor Reel is for you. 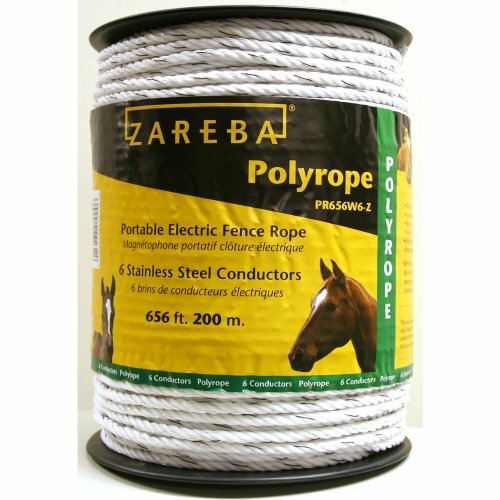 For those wanting a lightweight, effective electric fence which still has good stopping power, try the Zareba PR656W6-Z Polyrope. If you are looking for emergency electric fencing on a budget, opt for the Farmily Portable Electric Fence Polywire.